owlet: unschool monday :: so how does it work? Natural learning is organic and free-flowing. You can't plan it. Questions come, you answer them. You use the resources you have at hand. If an interest lasts for a while, you go to the library, visit the museum, speak to people. If the interest has passed, often its because the lesson has been learned for now, and you move on. Its not always about waiting for your child to call the shots though. You do normal family stuff. You can encourage interest by doing regular day-to-day things, celebrating festivals, living. Unschoolers will often talk of the word strewing. Perhaps you might find an old box of toys in the cupboard for your toddler and leave it out for them to find, then watch with delight as they discover and explore it. It works in a much similar way for school aged children. We might visit the library and I will choose a secret stash of books that spark an interest or a memory. We might plan a surprise trip somewhere, watch a movie. Sometimes it doesn't work, the time isn't right, but usually an interest is sparked. Children love to learn about new things. Unschooling works for many reasons, but one is because we know our children. We get what makes them tick, what interests them. We can follow their lead. One of the struggles as an unschooling parent, particularly one who has spent 20+ years in the education system, is learning when to hold back and not try to push what we think they should learn. Giving children the space to take charge of their own learning and decide what they need is truly the greatest gift of all. I suppose this why there are as many approaches to home learning/home educating/unschooling as there are home learning/educating/unschooling families. So what's it like in owlet town? Around here, we are inspired by the seasons. Big owlet went to a steiner kindergarten for two years and many of the rhythms there fitted within our family life really well, so we are occasionally inspired by them. On a typical day we get up and have breakfast around the table. We spend some time cooking, painting, crafting, listening to music, playing on the computer, reading... we'll have morning tea together about three mornings a week, with a teapot and cups with saucers and a candle and some flowers. Its a lovely way to pause and enjoy each others company and celebrate an ordinary day. After lunch we'll usually go out. For a walk, or to the park, or to ballet or gym, or a friend's place. Some days we decide to spend the whole morning at the botanical gardens instead, or the beach, or wherever. Its a great way to shake things up if we feel in a rut. We look at the seasons and what's going on around here. We set up a nature table and change it at the beginning of each season. We write a list of activities we'd like to do during the season. Its a little like the activity advent calendar we have each year and great to have there if we want some inspiration. We celebrate festivals. From a bunch of different cultures, including our own. We talk. We play. We parent. We live. The Unschooling Handbook by Mary Griffith for a good practical overview. Parenting a Free Child by Rue Kream for a great practical look at an unschooling family, day to day. Joyous Learning Australian home ed. forum. Liberated Learning another Australian home ed. forum. The Unschooled Life Lecture on youtube by unschooled artist Astra Taylor. I wish I lived at your house! Sounds like such fun. I will come back to this post Lauren, it looks like you have put a lot of good info in there. 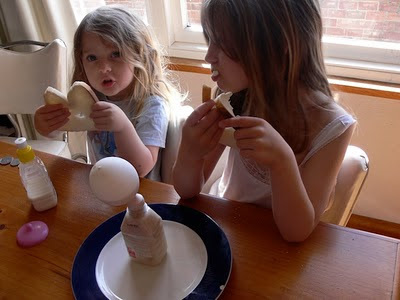 I can't believe though, that just this evening, we did the balloon/yeast experiment at our house! I like to bookmark these unschool mondays so that I can refer back to them. Yes we are fortunate to have found a way to afford for me to stay at home to do this. I talked a little bit about numeracy and qualifications in my post last week, but basically we cover a concept as it comes up. So big owlet has covered number patterns, basic multiplication, basic division, addition, subtraction, time, currency, fractions, statistics, measurement, volume and geometry without being prompted. I expect that the numeracy skills that apply to daily life will come up first and more difficult stuff will be approached if she has a need or interest. If we can't help her, we will find a tutor. If she needs a qualification, we will help her work towards that. Many of the universities here will take home educated students on direct entry based on their abilities and maturity. She can also go to college if she chooses and there are several pathways there that don't require examinations from an early age. We are not getting too ahead of ourselves just yet, but will wait for her interest and need to show where she needs to be rather than placing her in the system just in case. Hope that makes sense... I'd be happy to answer any further questions you might have. Beautifully, sensibly and informatively put. Thank you so much for the resources that you're providing me with!! Thankyou thankyou for all the info and the links Lauren. I feel like my world is changing since I started to read 'Teach Your Own'.